Payday loans are a single advance on your paycheck. Once approved, money is deposited into your checking account the next business day. Then on the next payday, the loan amount plus fees are automatically withdrawn from your checking account. Installment loans, also called term loans, are similar to payday loans except they are paid back over multiple paychecks. Some installment lenders advertise their loans as “not a payday loan” and although they differ from traditional single-pay-period payday loans, they are loans based on paychecks and pay frequency. Just like payday loans, once you are approved for an installment loan, funds are deposited into your checking account. Over the next few paydays, a predetermined amount is automatically withdrawn from your checking account until your loan plus fees are paid off. The number of pay periods and the payment amount are agreed upon and made known to you before you receive your funds. In short, both payday loans and installment loans are underwritten based on your paychecks, require a checking account with direct deposit, and are paid back using payments that are automatically deducted from your checking account. The advantage of installment loans is that you have a longer time to pay back your paycheck advance. This means that your APR or effective interest rate is lower but it also means you end up paying more fees. For example, a $300 payday loan from CashNet USA costs $75, equating to a 652% APR while a $300 installment loan from Plain Green Loans costs $214 but has a 359% APR. As you can see, the choice between which loan is best does not have an obvious answer, as the payday loan has lower fees but the term loan has a lower APR. The reason for this is the time value of money and finding the optimal solution is surprisingly quite complicated. Fortunately, in the case of a paycheck advance, because of the loan amount and opportunity cost, the best answer is fairly simple. It is best for the borrower to minimize total fees. To minimize total fees, you need to estimate when you can pay back your loan. If you can pay it back in one pay period or you renew your payday loan three times or fewer, it is generally better to take a payday loan. If you feel it will take you longer than three pay periods to pay back your payday loan, then you should consider an installment loan. The best choice also depends on the amount that you borrow. 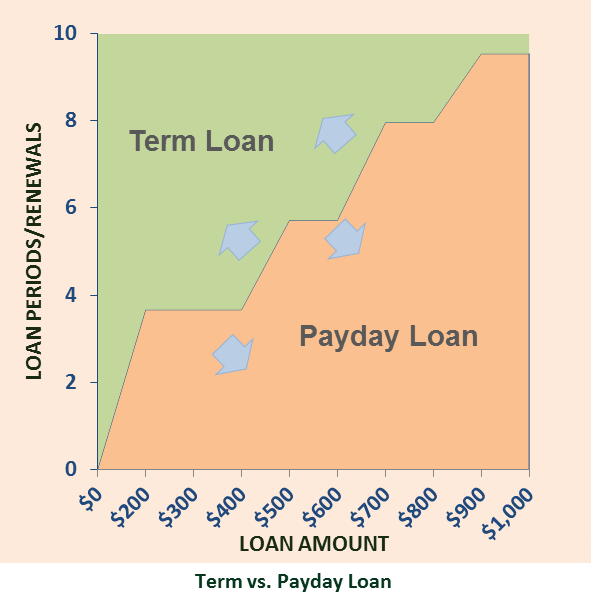 The chart above shows when a payday loan or installment loan is best. It assumes a 14-day or two-week pay period. So if you need six pay periods to pay back a paycheck advance, it is best to take an installment loan if the loan advance is less than $600, but if it is more than $600, it is better to take a payday loan and renew it. It is important to review your payday loan terms because some states limit the number of times borrowers can renew their payday loans. The Payday Hound’s most popular payday lenders are CashNet USA, Ace Cash Express, and Check City. These lenders are all state licensed lenders. CashNet USA is accredited by the Better Business Bureaus and is currently running a 50% savings on loan fees special (use the code NEXTADVISOR50 to take advantage of the offer). Our most popular installment loan lenders are Net Credit, Avant Credit and Rise Credit. All three of these lenders are state licensed lenders.